1 Why Do You Need a Dive Flag? 3 How to Care For Your Dive Flag? Any time you go diving, it’s best practice to bring a dive flag to stay safe. The best dive flag is the one that’s visible to nearby boaters so they know people are diving and will stay away. There are two main scenarios you might find yourself diving, the first is from a boat and the second is from the shore. 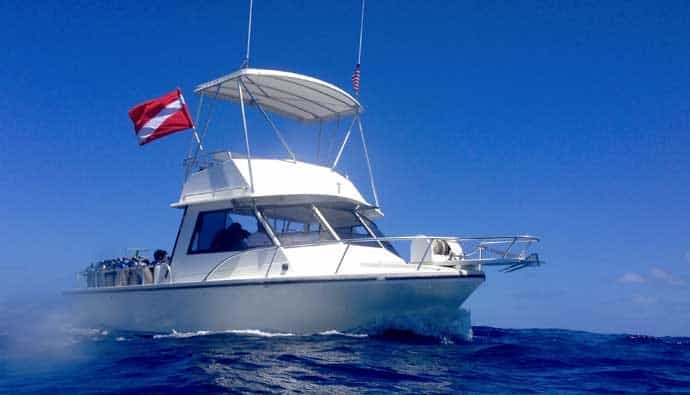 When you dive from a boat it’s important to place a diver down flag in a visible spot so nearby boaters stay away from the vessel and amount of feet around it. When you diver from shore since you don’t have a boat to hold the flat, you’re going to need a float or buoy to stick the flag on to. When you’re spearfishing many times this float is being pulled around by you because the float line is attached to the speargun. Since your head is not visible to a boater, you’re at high risk of injury from the hull or propellers if you come up at the exact time it’s passing over you. In many states, a dive flag is required by law. Be sure to check your local regulations because the fine will leave a bad taste in your mouth. Why Do You Need a Dive Flag? Anytime you get in the water you want to be safe. If you’re using a boat as a diving platform you’re going to need to signal to those around you that you are off the vessel and in the water. Your head is no match for a boat’s hull or propeller. Also, if you get stranded in the ocean and someone comes to check on a vacant boat, the dive flat will let them know that you’re in the water and they’ll conduct their search accordingly. You’re only as safe as the lowest common denominator of boat captain on the water. That means if you do everything right, you’re still at risk for someone being negligent. There will be some boaters who are simply cruising and having a good time and if you don’t have a dive flag visible, they have no reason be to on alert or adjust their duties to keep you safe. Sometimes even if you have a flat visible there could be a new boater who’s not aware of what the flag means, so it’s important to always be aware of your surroundings at all times. You’ll also see boaters from time to time who set the autopilot and get distracted on the water. This is the worst situation if a boat is barrelling down in your direction. If you have a flag large and visible, hopefully, that would give them enough time to adjust course when they come back to attention. This brings up another key point that most divers overlook. If you’re going to be using a boat, make sure you bring someone who’s aware of how to operate it while you’re diving. Too many times an inexperienced boat operator is left in a panic when they need to perform an action outside of their comfort zone. The last thing you want to be is stranded in the ocean and your backup has no idea how to rescue you. 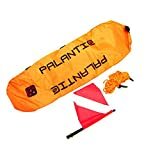 The dive or “diver down” flag is an essential safety tool to have on board your boat or float whenever you go scuba diving, freediving, or spearfishing. It should be hoisted to the tallest part of your vessel so it can be seen far and wide. Passing boaters who see the flag must avoid it by a minimum distance manded by the state you’re in. For example, Florida requires that you stay at least 300 feet away from the diver down flat unless the flag is placed in a narrow navigation channel such as an inlet. If you’re in an inlet than the 300 feet goes down to 100 feet. Either way, you’ll want to stay close to your dive flag at all times to give yourself a safety buffer and avoid any close calls. 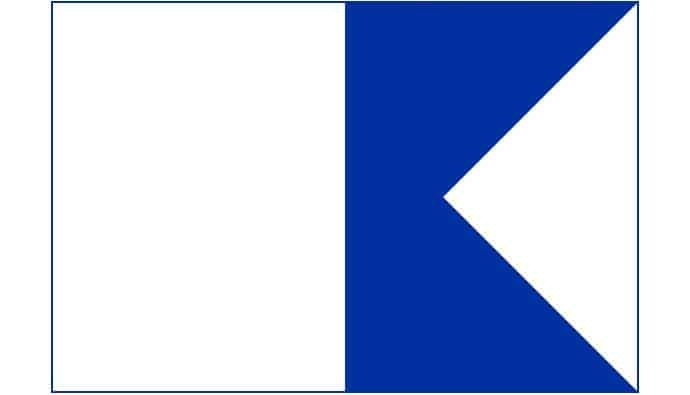 This is the diver down flag that is common in the US for telling boaters where divers are approximately located. 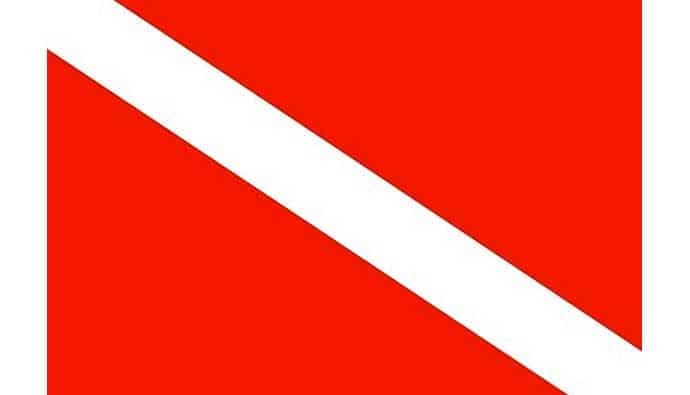 The diver down flag is well-known for being a red flag with a white, diagonal stripe. The stripe runs from the upper left corner of the flag to the lower right corner. You can use this flag to alert passing boat that you are currently in the water and your approximate location. This flag is only recognized in the United States. The Alfa flag is recognized internationally and is blue and white. If you’re diving from shore than it’s important to bring a float with a dive flag attached to it. If you’re able to anchor the float to the ocean floor than make sure you stay within the specified radius to increase your chances of staying safe. Some divers will fasten the float to their belt and let it drag along beside them. This allows the flat to follow the diver even if the diver is underwater and always makes sure the diver is protected by the ring of safety. Here’s a popular dive flag with a float. For more details check out the review near the end of the article. If you’re spearfishing, it’s also good to bring a float with a dive flag. This also doubles as a way to keep the fish from getting away after you spear it and keeping your gear safe. The only time this becomes a problem is if you’re diving in a kelp forest. Many times spearos opt not to bring a dive flag because they prevent them from moving efficiently through the water. While this is common, it’s not advised. It’s better to bring out a float and flag and clip it to a secure structure like a kelp branch just so people know you’re in the water. Floats can be made from different materials and can be either soft or hard depending on the application. Just make sure the float is of high quality so it keeps the flag steady and will be visible to those who venture near it. You can even find floats that help you carry different provisions or small equipment on it. Usually, those floats are shaped like a boat or donut with a center pocket for storage. This is the internationally recognized Alfa dive flag notifying that there are divers on board. The Alfa flag (alpha flag) is a white and blue flag with a triangular notch on the free end. This flag can also be used by boats who have divers in the water. This is also an internationally recognized flag, but that doesn’t mean every boater will know what it means. 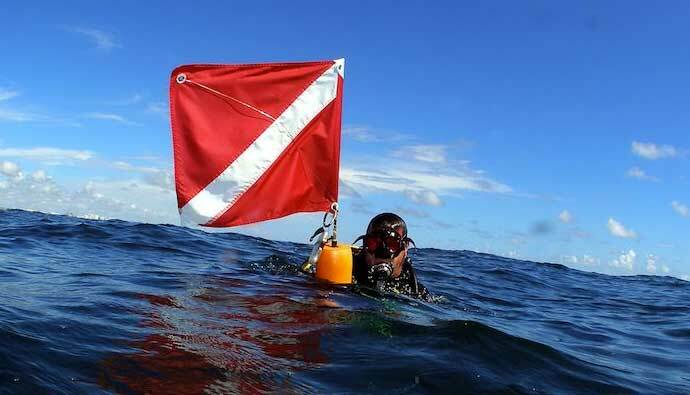 It’s best practice to use this flag in combination with the red and white diver down flag. How to Care For Your Dive Flag? Taking care of a dive flag is simple. Most of the time they need little maintenance. If for some reason you get a stain on the flag then you can throw it in the washing machine like you would a t-shirt. If the stain is bad, you can try soaking it in water with some detergent or dish soap. Since they are cheap, if the flag is beyond repair then it’s best to buy a new one. Don’t let your flag get faded by the sun to the point that other boaters don’t know it’s a diver down flag. Everything has a point where it breaks, so do the dive flags. There comes a time when you must repair a torn flag. The best and simple method of doing this is by using a needle and thread to stitch the flag. Even the basic thread will work, but if you want to get the best results, use specialized nylon thread. Sometimes you must repair a big portion of the flag. In this case, it is best to use some epoxy and a patch. The patch material can vary from textile to rubber or nylon, the later the better. Simply apply some epoxy to the patch edges and stick it on top of the damaged portion of the flag. Here is what you should look for when buying a dive flag. Always look for flags that meet the legal regulations in the area where you are going to dive. Different states or countries might have different regulations when it comes to dive flags. Are you diving without a boat? Get a flag that has a quality float. A float will keep the flag up while you are diving. Is the flag robust? Some flags are made of thick durable material and some are thin and will need to be replaced after a season. Opt for a flag that won’t fade quickly and will be rigid enough to be visible to those around you. 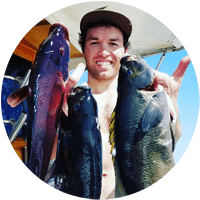 The Guardian Spearfishing Board facilitates arrival at the fishing site, transports equipment, water, food, catch, stores valuables like your mobile phone and GPS. An important safety feature is that it also gives the spearo a high-level of visibility as well as providing a place to rest if required. The plastic D rings can be a bit fragile. The straps can get loose over time. The size is good. It is visible when in the water. The build materials are good. Constructed of sturdy nylon and TPU fabric, the Torpedo Buoy is built for minimum drag in the water. 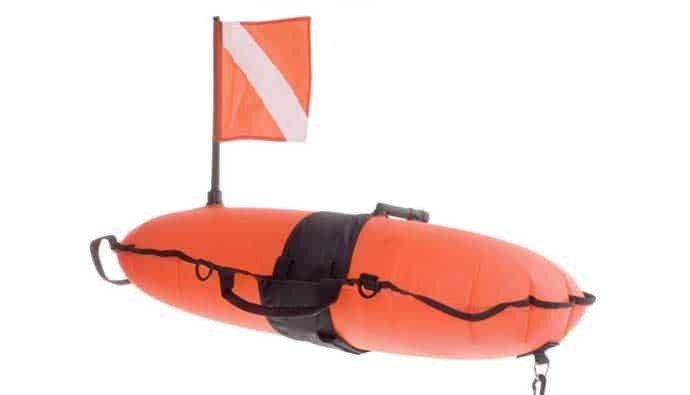 The Torpedo Buoy measures 33 x 10″ inflated and features four D-ring attachment points, oral inflator, flag, separate “add water” pocket for additional ballast and 60 feet of high visibility nylon line with plastic clips. The flag can come off if not put on correctly. The D rings have a tendency to fail over time. This float is easy to inflate and the construction feels sturdy. It’s not hard to miss this in the water. This float is made of Nylon 200D and has an inside bladder to keep it buoyant. It’s great for freediving instructors, freedivers, and beach scuba diving. This float is big enough for a diver to rest on if they get tired and the center console has a mesh bottom for drainage. This is a great place to store things like water or items you find in the ocean. This flag comes with a stiffener to keep the flag spread out and visible to boaters. The flag tends to come off very easily. Some people even think it is too sturdy at times, but that’s not a big deal. Very easy to inflate. Provides extra space for carrying food and other small equipment. The flag is very visible. Float Measurement: 30" x 6"
This torpedo float with flag comes in a bright color that makes it easier to spot in the water. The construction is well made and quality materials were used. The flag has standard dimensions and it is easy to be seen. The D rings are not quite durable. The line tends to get easily tangled. Replace the line and attach it to a real float line. This float is made from a tough Polyethylene Outer Shell and has a hollow core. The Polyethylene shell is the same material that kayaks are made out of. This float can cut through the surface chop well. It comes with clips and strap and the dive flag is optional. Measurements: 61cm x 19cm x 10cm. It also comes with clips and strap as well as legal dive flag. 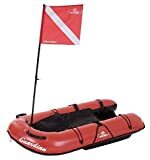 Since it’s not inflatable, it’ll take up more space before and after a dive in your car or boat. This product is very durable. It is resistant to tear in comparison to other nylon floating devices. The flag stays well attached. The flag is made from durable nylon with brass grommets. It is made according to the regulations. The stiffening pole is collapsible and it is easy to mount on a boat or a floating device. This 20″ x 24″ Red and White Diver-Down Flag is a must when going on any diving expedition. 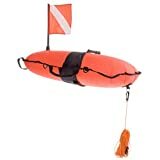 Place this flag on a pole or float to warn other boaters and watercraft there is a diver in the water. This Flag is easily attachable to a pole with zip ties (2 Included) or carabiner clips to display from your boat, kayak, jet ski or float. The bright and vibrant colors in this flag will make it impossible to miss. The included stiffener breaks down into 3 small sections to make your flag travel sized and vacation friendly. Laws about dive flags vary by state. Check your local laws for more information. This is the legal size and specification for Florida. The stiffening pole is required at all times in Florida but only recommended to use elsewhere when the conditions are calm. When there is a breeze the pole is not needed as the flag will fly on its own. Sometimes the stiffening pole will not be necessary especially if it’s a windy day. This product is very durable and the stiffener pole is a nice feature to increase the visibility. Q: What does a diver-down flag look like? A: There are two styles of diver down flags. The first is the diver down flag which is red with a diagonal white stripe that goes from the top left corner to the bottom right corner. The second style is the Alfa flag which is a blue and white flag that looks like two blue triangles pointing to the right. Q: What does a red flag with a diagonal white stripe mean? A: The red flag with a white diagonal stripe is not internationally recognized, however it is commonly used to indicate that a diver is in the water. Many states are now requiring this flag to be shown whenever someone is diving in the water, either on the boat or on a flat. Sometimes the Alfa flag is flown on the boat and the diver down flag is put on a float to mark where the diver is approximately in the water. Q: What accurately describes the two types of diver down flags? A: The diver down flag (also called a scuba flag) is a flag that is used in the water to indicate that there is a diver in the water. 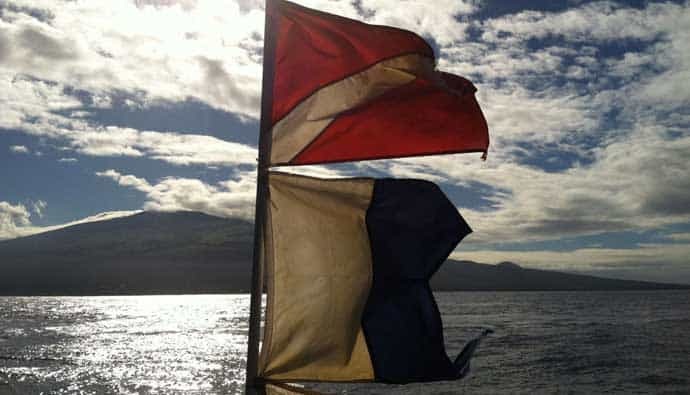 The internationally recognized code flag is called the alfa (alpha) flag and it is white and blue and used to signal that the vessel or boat has a diver down and those other boaters should stay away and should slow their speed when nearby. In North America, it’s common to use the red and white diagonal striped flag to mark that a diver is down below. 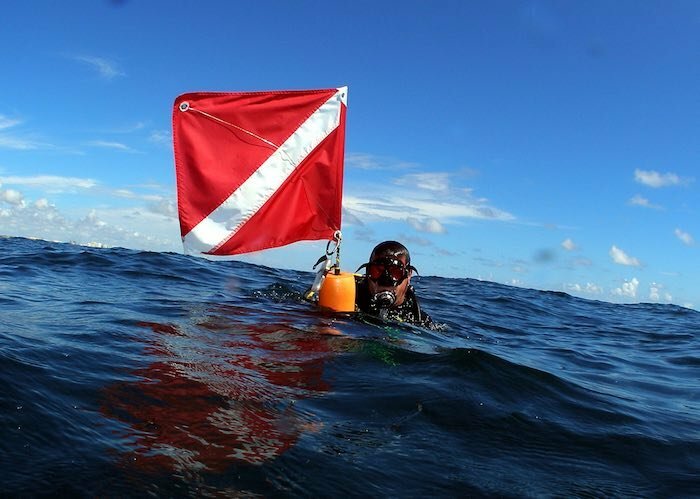 Q: What are the two types of diver down flags? A: The two types of diver down flags are the Divers Flag and the Alfa Flag. The divers flag is a rectangular red flag that must be at least 12 inches by 16 inches and have a two-inch white diagonal stripe if you are diving in United States waters. The Alfa flag is the International Code Flag A and is to be used on federally controlled or international waters. This flag means that the vessel will be conducting diving activity. Q: What does a dive flag look like? A: The divers flag is a rectangular red flag that must be at least 12 inches by 16 inches and have a two-inch white diagonal stripe if you are diving in United States waters. Q: What does a red flag with a white diagonal stripe indicate? A: This dive flag indicates that there are divers in the water and to mark the approximate location of the downed diver. Divers must stay within a 50-yard radius of the flag and vessel operators must not operate within 50-years of where the flag is displayed. Q: How far must a vessel stay away from a displayed diver-down flag? A: 150 feet or 50 yards. Q: How close should I stay to my dive flag? A: You must stay within 150 feet or 50 yards.